RobotUnion, the pan-European acceleration programme related to the robotics industry, has launched its second call with €4 million public funding for startups and SMEs. Through this call, RobotUnion will continue the acceleration journey with other 20 startups that will develop projects in the field of robotics linked to agri-food, healthcare, civil engineering and manufacturing. Each selected company could receive up to €223,000 public funding as well as access to technological support from European robotics experts and business acceleration services. The best-performing companies participating in the programme will have a chance to obtain an additional €1 million of private investment in funding rounds lead by the VCs CHRYSALIX and ODENSE SEED AND VENTURE, with the support of Blumorpho. The 20 startups and SMEs selected in the second open call will initiate an acceleration process of 2 up to 16 months. The participants will be always accompanied by Technical and Business mentors from their research phase all the way through setting up the business. The process is divided into 4 phases where, in addition to funding, the companies will receive extensive technical and technological support provided by the leading institutes in robotics R&D in Europe: VTT Technical Research Centre of Finland, Danish Technological Institute, TU DELFT, TECNALIA and PIAP. The participants will also receive business acceleration, led by digital business school ISDI. The startups selected will take part in a rigorous and personalised training programme and will have access to ISDI’s international network of recognised mentors from Google, Airbnb, Ikea, Yahoo, Prisa and Microsoft, among others. A special voucher scheme will be initiated by project coordinator FundingBox, giving accelerated companies access to a range of service providers via a one-of-a-kind marketplace fully dedicated to supporting robotics companies. The entrepreneurs will also have direct contact with leaders from agri-food, healthcare, civil engineering and manufacturing sector through the participation of corporate organisations including MADE, Ferrovial Servicios, ARLA Foods and FENIN. 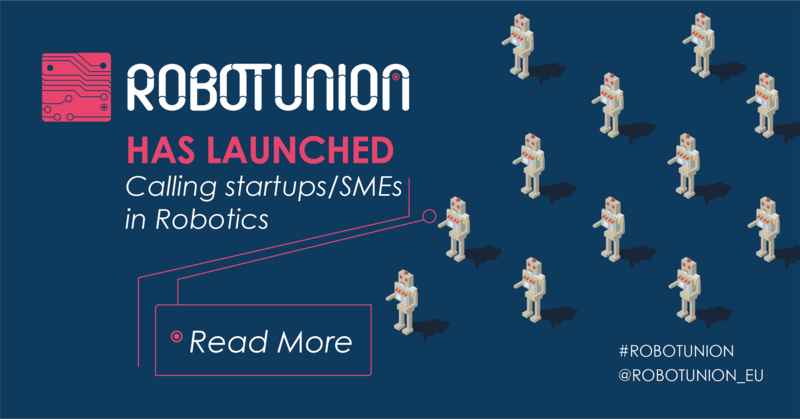 RobotUnion will further boost the visibility of startups and SMEs in the robotics sector taking part in top international events such as 4YFN at MWC Barcelona, Automatica Munich, Slush and Web Summit. The European Commission’s Horizon 2020 innovation frameworks have clearly identified that “There is a requirement to stimulate SMEs in the robotics sector to develop novel and innovative technology that has the potential to open new markets”. To address this need, RobotUnion is designed to reduce the two main sectorial barriers faced by startups and SMEs in the robotics industry: the elevated setup costs and the lack of awareness of the high potential that robotics represents for entrepreneurs and startups. The programme will bring together research centres, large corporations and innovative startups, with the aim of overcoming the elevated costs associated with the development of specific technologies for market entry. RobotUnion will also work with the selected companies and their respective ecosystems to overcome the psychological barriers and concerns that hinder the generation of entrepreneurial R&D projects in the area of robotics. 2nd RobotUnion Open Call will be presented at 4YFN 2019 during different events organised by Mobile World Capital Barcelona.